December 2013 - Merry Christmas! 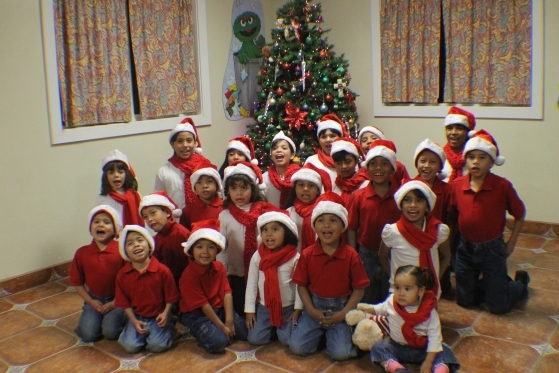 Christmas is such an exciting time of year for our children at Sonshine Hacienda. They have been busy decorating Sonshine's Christmas tree, decorating Christmas cookies and monitoring closely the number of days left before Christmas Day by taking turns changing our Advent Calendar. We also have many visitors who have dropped by to wish the children a Merry Christmas and give them a gift. We even had Mickey and Minnie Mouse visit us last week…life size no less!! The children also participated in our Christmas Spanish Church Service. It was a combined service of 5 churches in San Felipe. All of the children sang some Christmas songs for the guests and four of our girls participated in dance/tambourine numbers. It was such a blessing to see them dance for the Lord! 2013 has been a year of great change here at Sonshine. We have had some children leave us and return to their parents or were transferred to other Casa Hogars (Group Homes). But in spite of that, we have grown in number. We have ten more children than we had at the end of 2012. Praise the Lord!! We total 25 children at this time (that includes staff children, 3 of whom are not in the photo). We are grateful for the blessings that we are receiving by having these special children in our lives. All of you are a vital part of helping us change the lives of these wonderful children. We thank you so much for all that you do for the children at Sonshine Hacienda. We are looking forward to even greater blessings in 2014!! Please pray that God will continue to direct our path and lead us according to His will and purpose for these precious children. God Bless You! !